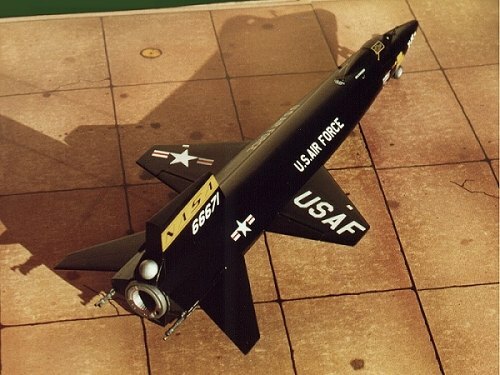 The X-15 has the distinction of being the fastest and highest flying "normal" aircraft (excluding true space vehicles), with an unofficial world record speed of Mach 6.7 and a maximum altitude of 354,000ft. Monogram's kit of this subject is quite nicely molded, albeit with fine raised panel lines. Some putty was required along the fuselage seam (horizontally split) and in the lower wing roots. The kit has a very well detailed cockpit with a posable cockpit cover. I have built this kit almost straight out of the box with just a few exceptions. The main modification required on this kit, is to open up the left cockpit window. 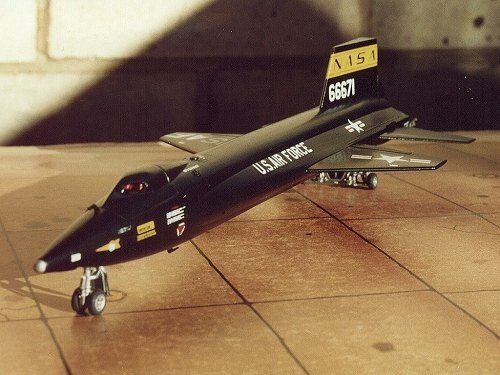 The kit is molded to represent the X-15A-2 late in it's career when it was used in trials of an ablative surface coating, which charred off during high Mach flight. This ablative residue coated the windows making them opaque and quite useless for landing. To fix this "minor" problem (hey, why do these guys need to see out? It's only a deadstick landing at 200+kt! ), NA fitted a folding shutter (eyelid) over the left cockpit window, which was opened before landing. Alternative decals are included for this ablative option, but the problem for us modellers is that the ablative coating was white and the kit is molded in black plastic! Anyway, I wanted to depict the most often seen version of this aircraft and it had normal oval windows on both sides of the cockpit. As well as opening up the left window aperture, it is also necessary to fabricate a new pane from clear acetate to fit the hole (I replaced both windows for symmetry). Good fun! I primarily used Humbrol paints on this kit, with gloss black hand-brushed on to ensure a good surface for the decals. The decals went on well, responded nicely to MicroSol with no silvering and are OOTB with the exception of the "stars and bars" which were noticeably out of register. The "bar" part of these decals was replaced with suitably sized strips of Xtracolor decal stripes. Also, the yellow panel below the right side cockpit sill was devoid of any text. This was restored by using a Verlinden rub-on detail "decal". After all this the model was sprayed with Testors Semi-Gloss clear lacquer (aerosol). I have yet to finish the auxiliary fuel/oxidizer tanks, being natural metal they require a lot of work to hide the seam. One day I'll get around to it!